Before we travelled to Italy, we really didn't know the difference between gelato and ice cream. We thought it was simply the Italian word for ice cream. Gasp! Don't ever say that to an Italian. Gelato is very different from ice cream and if you have ever been to Italy, you will agree. But how do you know a good gelato from a bad gelato? Well, just outside of Bologna, you will find one of the largest gelato equipment manufacturers in the world. 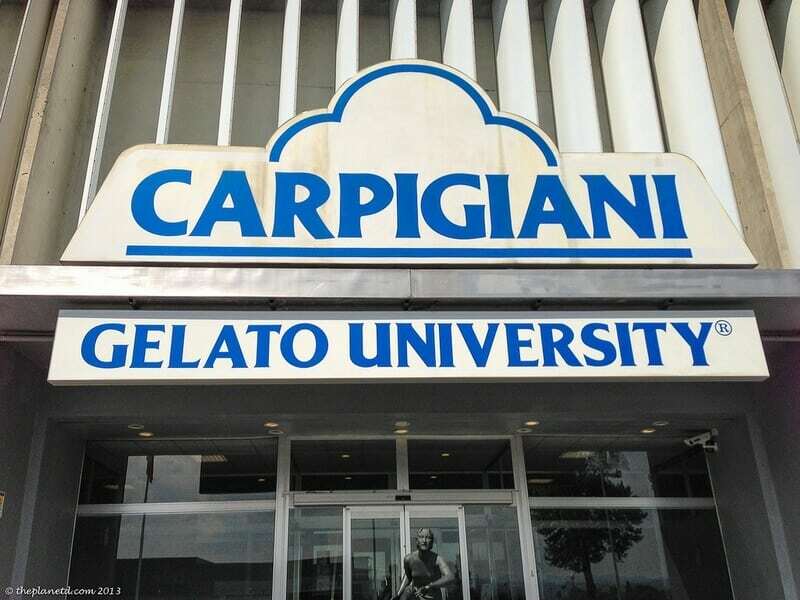 Carpigiani Gelato not only sells quality gelato machines, they also offer courses to the people who buy them. And here we thought all gelato was made by hand. If you love Gelato, this tour may intrigue you. A short half hour bus ride (€2) from downtown Bologna will take you to the manufacturer where you can tour the museum and taste the gelato that students make. I have to admit, learning that the Romans and Greeks were the first gelato makers by taking ice down from the mountains and flavouring it themselves wasn't much of a stretch. That's sort of like saying someone was the first juice maker by squeezing oranges or adding lemons to water. 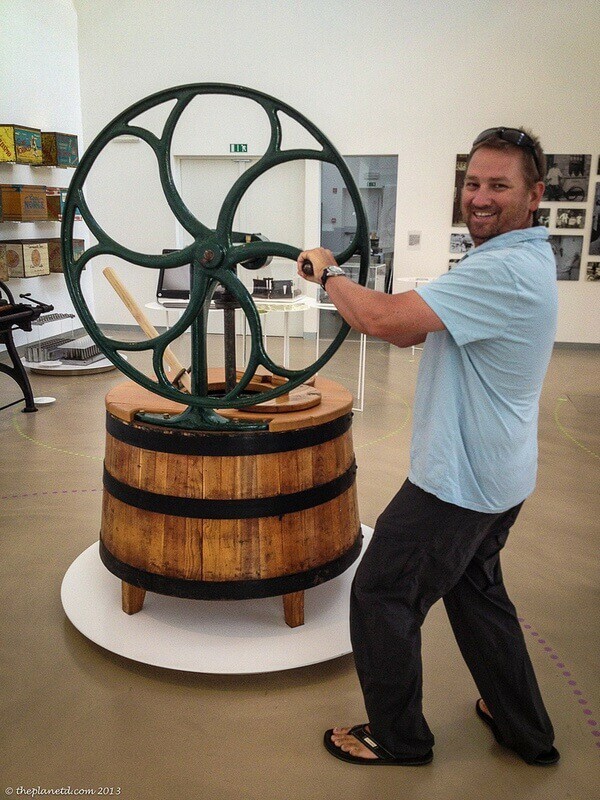 But, really how much can you come up with when it comes to the history of ice cream making? 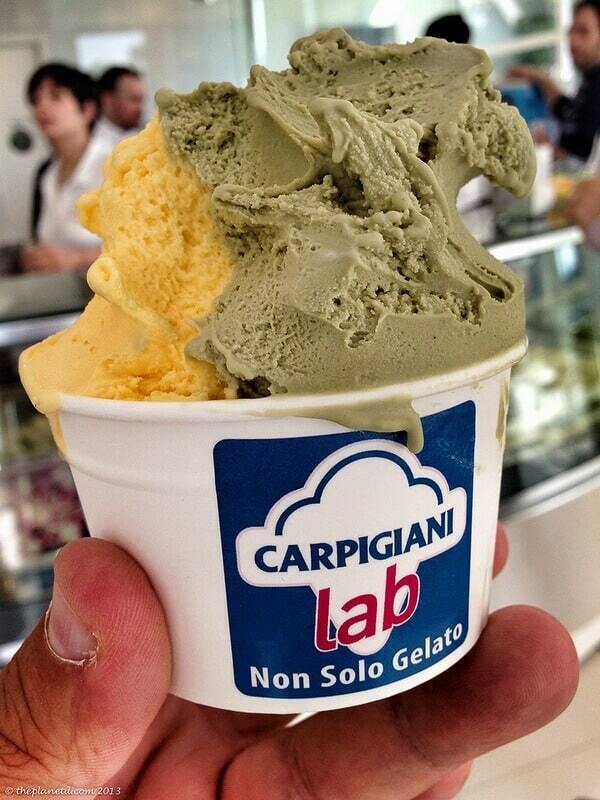 If you are looking to start your own gelato business, Carpigiani offers a week-long course for around €900. They're main business is selling machines though and if you do decide to open your own gelato shop, you will need to invest in one. If by the end of the week, you are feeling confident and buy a machine at about €20,000, you'll have that €900 put towards the cost of your machine. Like every new business though, do your research and think long and hard about it before jumping in feet first. We were not taking the course and chances are you won't be either, but if you are like us, you will want to learn all about how to choose the best gelato, so we're going to give you some tips to help you eat the very best gelato during your next vacation in Italy. Plus, if you visit the museum, they'll send gelato home with you, they donate thousands of kilos a year to hospitals, orphanages and homeless shelters and they still can't get rid of it all, so take advantage and bring some back for a midnight snack! Gelato has very little air compared to Ice Cream. So instead of eating a bunch of empty calories like you do in ice cream, you are eating pure cream when indulging in gelato. Ice cream can have over 100% air pumped into a scoop where as the average air found in gelato is 35%. What does that mean? Well, when people make ice cream, they make sure that when the milk fat and sugar are mixing, a lot of air is being pumped into the mix to take up more space and give the illusion that you are receiving more product. Ah, that explains the supersize helpings of the US compared to the tiny servings in Italy. I always feel so satisfied when I have a single scoop in Bologna compared to a giant helping in the US! Another difference between gelato and ice cream is the amount of fat and sugar. 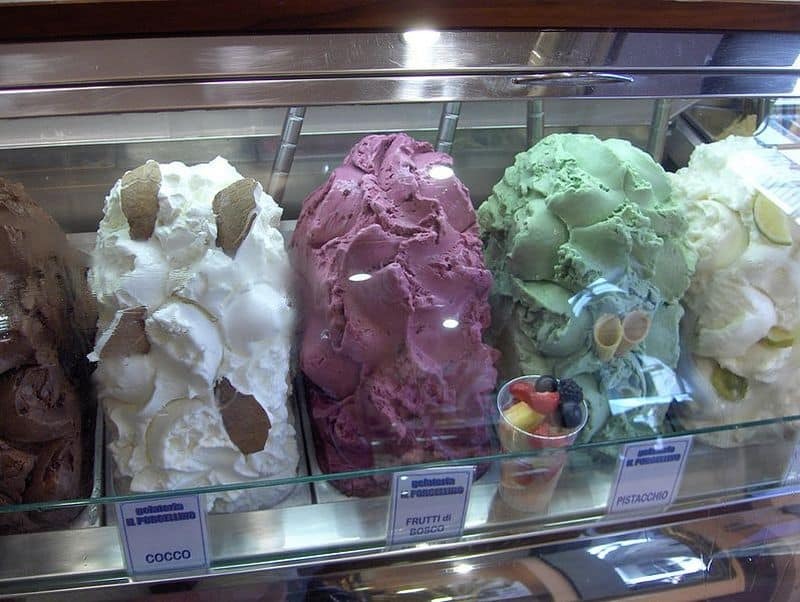 Gelato has a fat content of less than 10% while ice cream has an average of 18% to 20%. So, don't feel guilty eating gelato, embrace it and join the Italians. They claim that it is very healthy for you and who are we to argue? So now that you know the difference between gelato and ice cream, it's important to find the right gelato shop to buy from. Many shops in Italy claim to serve proper gelato, but they pump air into it and put in powdered flavouring as opposed to fresh. If you are in a very touristy destination, you will find a lot of impostors churning out bad gelato to unsuspecting tourists. Don't be one of them, find the best gelato in town! Real gelato is not pumped up high like this. Photo courtesy Wikipedia. See that wonderful looking gelato up there all swirly and bright in colour? Doesn't it look delicious? 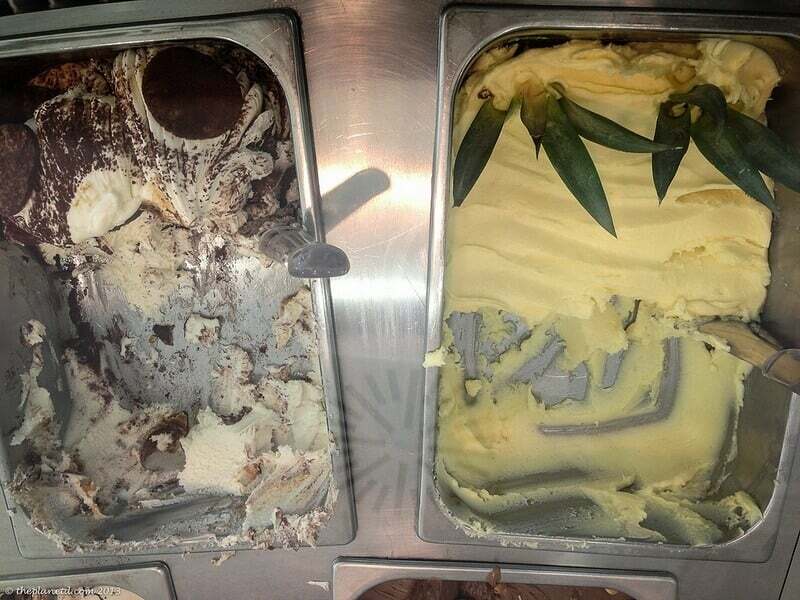 That is not good gelato, avoid shops like this one and here is why. Never buy gelato that is pumped high above their containers. First of all, they won't stay cold and fresh and second, this means that the gelato has had a lot of air pumped into it. You want rich and creamy gelato, not light and airy. So look for gelato that is flat in it's cooler. This is the real deal. As I said above, a lot of touristy gelato makers will add powdered artificial flavouring. It's easy to spot the fakes, just look at the colour. There are three tells that will easily help you identify bad gelato. And finally, you are entitled to a dollop of real cream on top of your gelato and you should be offered the choice of two flavours. Pairing Gelato flavours is important so don't be afraid to ask the gelato master. They'll know what you should have along side your favourite flavour. Most of all, enjoy! Don't be intimidated by Gelato, walk into that gelateria and show them who's boss. You know what you're doing now. And seriously, how can one ever go back to ice cream once you've had gelato? It's more satisfying, better for you an oh so Heavenly. I can't understand it when I see tourists in Bologna walking down the street eating a McFlurry when there's delicious gelato next door. That's just wrong. Our Trip to Italy was part of the This is a Blog Ville campaign, created and managed by iambassador in partnership with the Emilia-Romagna tourism board. « Leaning Tower of Pisa – Is It Worth The Visit? 37 Responses to "Gelato vs Ice Cream a Tasty Showdown from Bologna"
We did the same and took the class in October 2012. But seriously, who can say no to gelato? Delicious noms for a hot day anywhere! Thanks for this wonderful article about Gelato Maker and hoping to post more of this, so i’ll put it on my bookmark list of http://www.gsgelato.com . Gelato beats ice cream hands down, for such a flavoursome taste! 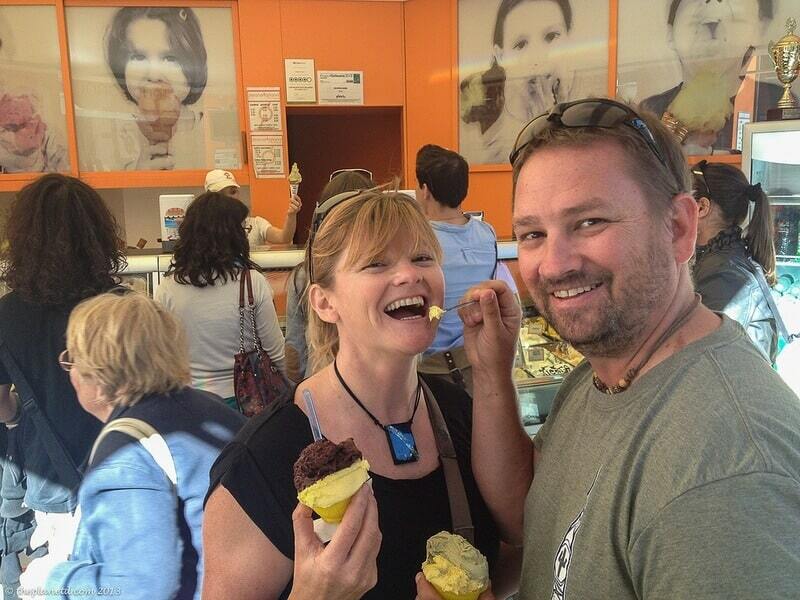 I’m so jealous you went and experienced all that Italy had to offer in terms of gelato – looks like you had a blast ! Thanks for the tips on how to distinguish fake gelato from authentic gelato. Seeing those gelato that you had gives me a sugar rush right now to grab one and eat it while it is hot outside. Glad we could help. I’m hungry too! Wow Dave and wow Deb!! Great article… and great advices! You are now real experts! Many thanks for spreading the GELATO culture worldwide! Hope to see u again somewhere for the Gelato World Tour! Thanks guys and thanks for having us! Maybe we’ll see you out there on the World Tour. I love gelato, but I didn’t know about the tips for making sure if it’s real gelato or not. I’ll have to keep an eye out for gelato imposters the next time I’m out for gelato. WE didn’t know until going to Italy first either. Once you know the tips, it’s easy to spot. My kind of museum. Those are good tips — never thought about the shape! We had a few great gelato experiences in Italy recently. One night in Lecce we had a delicious serving at one gelateria, then another large helping at a second gelateria — with about 5 minutes in between. It’s addictive. Haha, I love it, you can never get enough gelato. I agree, we do need a re-do. We’re going to have to go back and try some more gelato. Awesome, thanks for sharing how to spot a good gelato from the poseur ones! Cheers. Glad we could help cheers! Really top quality gelato is freshly flavoured too. They use a frozen base and mix in ultra fresh ingredients (like nuts, coffee, mint etc) daily – then discard the remained at the end of the day. Great point Fiona, the fake stuff uses powders and syrups and the good stuff is all fresh ingredients. I wish it was our talent, but we had someone take it for us. I believe it was Nicholas of Emilia Romagna tourism. I think that the gelato is a great Italian treat and if anyone has tried it during his travel of bologna, then he can never forget its taste and it becomes one of the most pleasant travel memories of his life. You are so right. I have wonderful memories of gelato during our travels. You’re welcome Nicole, it makes all the difference. Great job Dave and Deb, I am new in your blog and is great !!! We live in playas del Coco, Costa Rica and we just one Gelato shop here and it is delicious, a little expensive but good. Thanks for being an inspiration for all travelers. Thank you for the nice compliment. We haven’t made it to Costa Rica yet but hoping to add it to our travels very soon! We’ll definitely check out your gelato shop. Sadly the Gelato I had when I was in Italy was not all that good. Aw bummer, you have to go back for some good stuff! 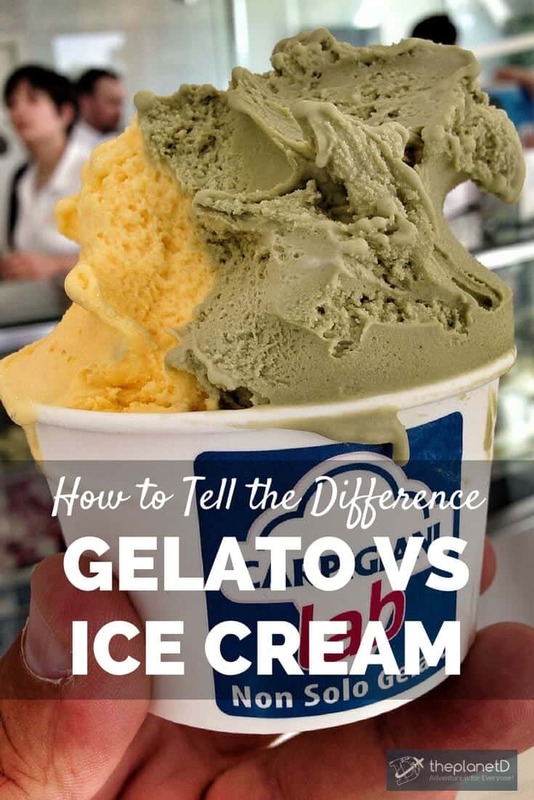 wow, I had no idea that’s how you spot really good gelato, now I know to look for the not too over the top stacked and loud colors, its fake – sad to say that for Italy and the tourist areas there catering with bad gelato at high prices! I know eh, sadly tourists only get exposed to the bad stuff and it’s way too much. In Bologna, we were paying just a couple of euros for the perfect amount. YUM! We have been in Italy nearly a month and have enjoyed all types of Gelato, almost every day or every other day. Traveling with 2 kids will do that to you. I think we have noticed a difference between shops and didn’t know why… now you have explained it! Either way it is good in this summer heat and tasty. Thanks for sharing. I’d take gelato over ice cream any day! Yum. Me too, there’s no comparison.